We are off for our annual Pig Roast. 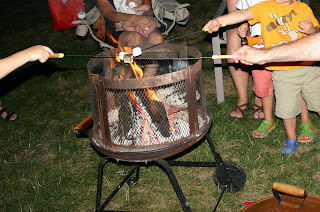 I won't have time to write, too busy making s'mores. Remember the Pig Roast last year, Mom? I remember. On Sunday before the big event I was going through my list in my head . . . Tuesday & Wednesday final prep on the house and errands, Thursday in-laws arrive (15 for dinner), Friday put the pig on the coals & set up tents in the back yard, Saturday 100 or so guests. I think I have everything . . . .
“Honey, my sister called,” my husband’s voice pulls me out of my thoughts. “She’s in a bind for a work event. She wants to drop her three kids off here on Tuesday morning and then she’ll be back late Wednesday night.” (My sisters-in-law are immensely helpful in putting together the party). “Uh, well, it wasn’t really in my plan and all, but I guess we can work that in,” I replied lamely. Let’s see . . . six kids ages 10, 8, 6, 4, 2, and 7 months, big party coming up. I decided that as soon as they walked in the door Tuesday morning, the fun would begin. We would take pictures of everything. My 8-yr-old niece would be in charge of scrap-booking it before her mom returned (I don’t scrapbook). We had 48 hours. We went to the zoo, had ice cream, played, cleaned the house, ran a few errands. That was the first day. The next day we had to get busy. By the next day, it had become a bit of a lark walking into stores with six children. Their ages were perfect – everyone just assumed they had to be all mine. They had paired up and figured out a system and were so incredibly giggly and happy everywhere we went that the man at the meat market gave them all free samples even though they were running around with the carts (oh, and we bought over 40 lbs of brisket and would be back for the pig on Friday). We went to Walmart. We went piñata shopping. When I went to get the wardrobe boxes for the smoker lid (yes, this is a fancy operation) it began to rain. Think about this: six kids in a minivan with enough food for a huge party, two piñatas, candy and paper goods from Walmart. Where would you put two flattened wardrobe boxes? It started to rain harder. I tried to push it in the back. I ran around to one side and then the other. The kids were in complete hysterics. I wasn’t sure if it was just the rain in my face or if I was laughing so hard I was starting to cry. Finally, with one big push, I shoved the boxes between the front row of seats and the second row, right behind the driver’s seat. The laughter now was a complete uproar. I jumped into my seat, looked in my rearview mirror and saw . . . box. “Hey, where did everybody go?? ?” More laughter. By the time we got home and unloaded the car, everyone was pretty soaked. I needed to start dinner to feed this tribe. The kids had been in the car awhile and were ready to run around. It was raining harder now. For over an hour, five hysterical and soaked kids played outside in the rain. I made dinner, fed the baby. Everything on the list was done. By the time their mom came back they were all dry, the scrapbook was done, and the little ones were in bed. What DOES one wear to a pig roast? Our family has an annual pig roast. I could explain how that happened, but perhaps that is a story for another time. The bottom line for today is that for the past five years, we have been the hosts of this gala event. This year, my in-laws are hosting. This could explain why I have slightly more time on my hands this summer to do things like blog. I am NOT having over 100 people to my house. I will not have 30 or so here for several days. To my children, this event is no less significant than Christmas. It's HUGE. Which, of course, is among the reasons the event continues. And, probably the only reason that there is a twinge of sadness that the event isn't at our house. That, and the fact that I like having people over. In any case, I have not had much chance to be online because I am preparing for an event on the order of magnitude of Christmas. The above picture is of the dress I made for my daughter for the event. 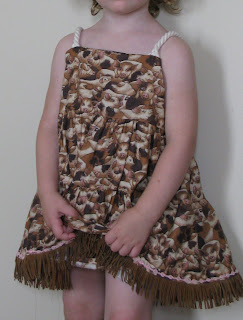 In case the picture is not clear, that is a 3T dress made out of pigs-wallowing-in-mud fabric. Honestly, I would consider cutting corners and buying one, but I have noticed that few manufacturers make dresses featuring pigs wallowing in mud. Shocking, isn't it? I should, of course, have a picture of the collared shirt I am making for my son that features "pigs-riding-on-motorcycles", except that it is not done. It will be done tomorrow night, in time for the weekend festivities. I am not sure why these are not popular themes, especially considering the big holiday this time of year. Really, just ask my kids. I tucked them in tonight and the last words out of their mouths? Who had married the true love of his life. They met one day in California and soon she’d be his wife. They’d have three kids, they love so much, but love their grandkids most. And even better, that Air Force hospital, barely charged a fee. They went on to have a sweet girl, then got lucky twice. Then after his first degree, he even passed the Bar. Then came two new grandkids, they’d have one of each. But she’d come back to be a mommy, after she found her man. They’d have a boy and then a girl too, then a boy makes three. I wrote this about an hour ago for my dad's birthday. I decided to start a family blog for him. Its not the best poem, but it comes with lots of love. What does one get for a father? My husband asked me out to dinner tonight. “Well, just started,” I replied. “Sounds fantastic,” I said. And deliciously spontaneous, I thought. “Great. Andrew and I will be waiting.” He had our 5-yr old with him. I would bring the two little ones. “Oh, and bring a cooler with ice, we have perishables from the grocery store in my trunk.” Okay, I thought, we’ll call it suburban spontaneous. I slipped into my heels. I slid into the minivan with my cooler and my children. The one year old sucked his thumb. The three year old was screaming. (She doesn’t nap, but probably should some days). Like any sensitive mother of three, I turned up the music. She fell asleep in under a minute and I was quickly enveloped by the loud music, off into my own thoughts, imagining a fabulous dinner and a glass of wine. Then I saw it. It was a pristine, bright red, loud and proud Corvette. Ha! I scoffed. Just a Corvette? It felt good. For those few seconds, I felt the acceleration: the thrill. I was one with the engine and the road. For those few seconds it was all about me. Authors note: Yes, my minivan went 20 to 40mph in under 30 seconds. The Corvette didn’t notice (okay, he was only going 30mph and was probably lost). Hey, this is suburban spontaneous, what were you expecting, really? I was doing laundry the other day. I am a stay-at-home mom and, although I don’t entirely include laundry in my job description, I do seem to be the most logical person to do it. After all, I am within several yards of the laundry room more often than any other adult in my house. Yes, I do laundry. Where was I? I was doing laundry. Did I mention that I wasn’t just doing a little bit, but I was doing a whole houseful of laundry before taking five relatively messy humans on a long trip? Oh, and I had decided it would be a reasonable time, since I was doing laundry, to wash all the sheets as well. And, I needed to sort socks. We have upwards of 80 pairs of socks in the house; none of them match. It was driving me crazy. The dryer reached at least 350 degrees. I could have fried a steak on my dryer (I wish I had thought of it at the time, I could have made dinner as well). I left. I came back. Surely, I thought, this thing will cool off. Surely, other housewives do this much laundry. Do people really just do one load a day? It was still hot. Then, I couldn’t help it. I was a little frustrated, I guess, but more importantly, it just seemed like the right thing to do. My kids watched. It was full of lint (surprised I didn’t find any socks, or even shoes) so I got the vacuum. My kids watched. Perhaps I shouldn’t have been surprised, but the vacuum started to get really hot. It slowed down. My dryer was overcoming my vacuum. I couldn’t let the dryer win this easily. I turned off the vacuum. And, I took it apart. The beater brush was full of threads. Every tube was full of dust. I know I shouldn’t have done it, but I have a shop vac in my garage. I pulled it out. I was going to vacuum my vacuum. Yes, I really was, except the shop vac wasn’t pulling a vacuum. Yes, I took it apart. This time, though, I didn’t need a screwdriver. I found the sock in the hose: of course, a sock. I vacuumed my vacuum. I vacuumed my dryer. The kids watched. Just as I was ready to put the dryer back together, my husband walked in from work. “I’m in the laundry room,” I called. He saw the shop vac (now fixed), the vacuum, about a quart of lint on the floor and his wife with a set of screwdrivers, working on the dryer. My very best friend from college, Kay, had her first baby just three months before I delivered my third. This was both good and bad. It was good because now we have children the same age. It was not-so-good because at the time I desperately wanted to be with her after the delivery, and it just wasn’t the best time for me to travel. We are no where near each other. Besides the pregnancy, my eldest was not-quite-four and my middle child was still just 18 months old. I don’t have local family to help out. It wouldn’t work. We don’t talk nearly as often as either one of us would like. (I think if she reads this, she will agree with that.) It is very difficult to keep in touch. I’m not sure why some people are able to do it so well. I’m horrible at it. I try. This blog is one attempt at it. A few months ago we were talking, trying to catch up, forgiving ourselves for never being quite there, when she said it. “No, we just can’t,” she said. “Oh, um, why?” I wasn’t quite sure what to say. Her tone was quite flat on the phone. We talk now and then, but there is never a moment when we both have time. She called me today. We were talking about lots of different threads of conversation, and then about our experiences with our first children, when they were very little. The difference between changing your mind and second-guessing yourself is defined by your actions. Did she pick the right name? It hardly matters. The victory is in the confidence to change your mind; to take action, or decide to move on. It becomes a victory. Emerge victorious. I graduated from MIT and worked for 10 years as an engineer and in business development, mostly in Japan. I loved my work, was very successful, and conducted business in Japanese. I dreamed of a Masters in International Relations and was accepted to Johns Hopkins School of Advanced International Studies just at the time my husband and I were starting a family. My husband could have stayed home, we could have chosen day care options, but I decided to be the stay-at-home mom. I opted out of JH SAIS (still hard!). I worked 13-hour days, took a half-load of classes at U of Michigan and started a Japanese language seminar (and struggled with fertility issues). When we moved for his career, I was finally pregnant and quit everything to move to a small city in the Midwest. We lost the pregnancy during the move, so I had no job, no school, no kids, and no family in the area. I knew no one. Ever accidentally find yourself become a mid-western housewife? Soon, I was pregnant again and had landed a full-paid scholarship to the best local MBA program. The program started three weeks before my due date . . . so I opted out of that too! Today, I am the mom of a 4-yr old, a 2-yr old and a 7-mos old. Up until a month ago, I was the president of two volunteer organizations. My children have friends, my son reads (and says thank you), my daughter is almost potty trained, my 7-mos old is a wonderfully happy baby. My career? Perhaps when all of your plans fall apart at once you have to learn to NOT define yourself by your career or your family. No matter what is thrown at you, you are still smart and ambitious. My friends are teachers, musicians, lawyers, Phd's, consultants . . . all mommies. My house is filled with noise and chaos, “no, honey, not now”, “get off your brother, he's a baby", "yes, the earth is rotating, you just don't feel it because you are rotating with it. . . ." Yes, I did explain to my son that he is moving very quickly through the universe in multiple directions. He also knows what happens when you move a magnet across wires and how our air conditioning works. But, more importantly, someone who loves him was right there to answer him. Its hard work and its not at all glamorous. It’s a bad financial decision. The first year was a horribly difficult and exhausting experience. If you consider that you have worked hard to earn your degree to improve your world, is there a better way to improve your world than to dedicate a few years to the next generation?